Today saw version 6.1.4 of Time Clock MTS uploaded to our website. As usual upgrade installers can be downloaded from here or you can see some detailed instructions showing you how to upgrade your software here. This release includes some serious improvements in report generation speed, reduction in access to the back-end database (Network Edition or Network PLUS Edition), and some minor bug fixes. Detailed release notes can be found below. Major reduction of number of queries made to the back-end data file, this was done by either caching certain data (such as employment types and holidays) or by preventing needless queries for employment types, bulletin assignments, bulletins, and holidays. In addition several cross table queries have been implemented to reduce the number of queries used. This includes getting job details and time notes when a time object is selected from the database rather than getting it later. Areas of particular improvement are the Edit Times screen, the Data Export process, and updating of employee details on the Employee List screen. To help speed up the time taken to create reports a new in-memory cache system has been created. This stores employee time punches in memory for later use during report generation instead of querying the database repeatedly for the same information. In some cases this has lead to a reduction in queries of up to 80% and report generation speeds appear to be anywhere from 2 to 5 times faster than previously. Currently this is implemented for the Payroll Summary Report, the Punchcard Report, the Working Hours Report, and the Data Export System. If no problems with the caching system are found it will be rolled out to all other reports in the next version. Deactivated employees no longer appear on the Missing Days Report. The “Total” heading on the Daily Job Time Report has been changed to “Total Cost”. The file location of the connected data file is now displayed on the Help->About screen. Reports that allow filtering out of zero activity employees now have better filtering. For example, employees who are deactivated no longer display, and employees whose hire data is AFTER the report date are no longer displayed. A fix was made to available sick and vacation time when the accrual start date was overridden at the employee level. Windows version detection (used for debugging and error reporting) has been moved to a .NET component and now actually works. 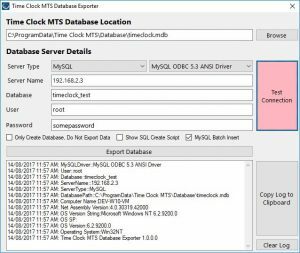 We’ve just made setting up Time Clock MTS to work with a SQL Server Database or a MySQL Database much more quicker and simpler. 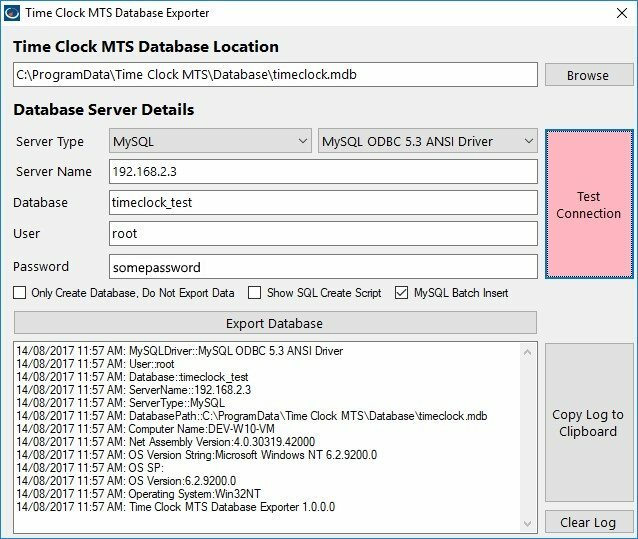 Our new Database Exporter tool (see the image below) can take all of your existing time clock data and send it straight to an empty SQL Server / SQL Express database or to an empty MySQL database. It makes setting up the Network PLUS Edition of Time Clock MTS a whole bunch easier, allowing your time clock to support up to 100 time clock stations and track up to 1000 employees! You can read more about the Network PLUS Edition of Time Clock MTS here. We’ve just uploaded Time Clock MTS Version 6.1.1. This constitutes a major release and includes a number of new features, enhancements to existing features, and several bug fixes. There will be a a series of posts focusing on individual new features in coming days and weeks but this post will cover all the changes in a broader fashion. Administrators can now display a message next to an employee’s name on the employee list. For example, their location if they are working off-site, or perhaps showing the day they are due back from vacation. Employee list messages are controlled from the Tools->Employee List Messages screen. A message can now be displayed to the last employee who punches out. The last person out message is configured on the Tools->Options->Display Settings screen. The Job Labor Breakdown Report has been added. This report gives an easy-to-understand tabular summary showing the time breakdown for each job. Time is broken down by normal hours, OT1, Weekly OT, and OT2. The Active in Period Report has been added. This report simply shows which employees have recorded time (or not) during the report period. When the administrator is manually punching employees in or out using the Edit Times screen they can now set a time for the event rather than just defaulting to the current time. So, if for example, a group of employees has forgotten to punch out in the afternoon the time clock admin can punch them out and set the time to their normal end of day. Check boxes have been added next to employee names on the Edit Times screen. Checked employees can be punched in or out using new “Punch In Checked Employees” or “Punch Out Checked Employees” options under the Punch In / Out Toolbar button. The Kiosk Mode setting can now be over-ridden in the Time Clock MT Client software. This could be useful if you wanted a dedicated time clock computer in Kiosk Mode for employees to punch in and out from but did not want the software operating in Kiosk Mode on other time clock computers. An employee can now have a negative starting balance for vacation or sick time. Negative balances are only possible at the employee level on the Payroll Information screen, they cannot be set for the whole accrual scheme. The system that detects if you have the Time Clock MTS admin software on more than one computer has been reworked. The Stand-Alone Edition simply cannot have more than one instance of the Administrator software running. The Network / Network PLUS Editions can but each instance after the first counts against the allowable Client limit. Also, when a second instance is started a warning message is displayed on startup but the software can still run as normal. However a lock is now put in place to stop two people being logged in as the administrator at the same time. So while more than one instance of the Time Clock Administrator program can run at once, only ONE person at a time can be logged into the administrative functions of the software. The warning messages displayed when the allowable Client limit has been exceeded on the Stand Alone Edition or the Network Edition have been cleaned up and (hopefully) made a lot easier to understand. The new Employee List Messages are now displayed on the Employee Status Report. So, if for example, an employee is punched in but currently off site and this is noted via the Employee List Message system then the report will show that fact. Extremely useful in the event of an evacuation. A Job Name column has been added to the Job Details Report and the default page orientation has been changed to landscape. As a part of the ongoing process to migrate the software to 100% .NET various dialogs and popup message screens have been replaced with .NET alternatives. If deactivated employees are hidden from the employee list then they will now be hidden on the Edit Times employee list. For those who didn’t know, deactivated employees can be hidden from the employee list by right clicking on the list and selecting the “Hide Deactivated Employees” menu option. Obviously this only has any effect if you are logged in as the Time Clock administrator. New field <RATE> added to Event Based export formats. This field shows the hourly rate for the given time punch. Implemented a new data caching system to help improve speed of certain job-based reports. Should result in around 10-20x speed improvement in generation of some reports. The popup key pads used for PIN or Job Code entry have been increased in size by about 50%. This should make them a lot easier to use on a touch screen. New field <UNIQUE_ID> added to the Employee Header and Employee Details report section templates. Can be added as usual via the Tools->Options->Report Setting screen. New field <TOTAL_WORK_TIME_INCLUDING_HOLIDAYS> added to the Payroll Information report section template. New field <HOLIDAY_DETAILS> added to the Payroll Information report section template. This field will list holidays and credited hours for the report period. If there are no holidays in the report period nothing will be displayed. Various text and numeric fields have been increased in size for easier data entry. Additionally many references to “Clock In” and “Clock Out” have been changed to “Punch In” and “Punch Out” for better continuity. The Manage Connections screen has been increased in size. If using the Network PLUS Edition with SQL Server deactivated employees appeared first in employee lists. They now appear last in lists. Zero activity employees are now excluded correctly from the Daily Hours Report. The Invalid Procedure Call error some users were seeing on the Employee Bulletins popup is now fixed. Employees with compulsory job tracking cannot be punched in on the Edit Times screen without entering a Job Code. Fixes have been put in place on the Edit Times screen to stop invalid time punches being created by the administrator.